Acumatica Singapore: Account specific Cost Center access. Account specific Cost Center access. During financial system implementation I have faced this challenge. 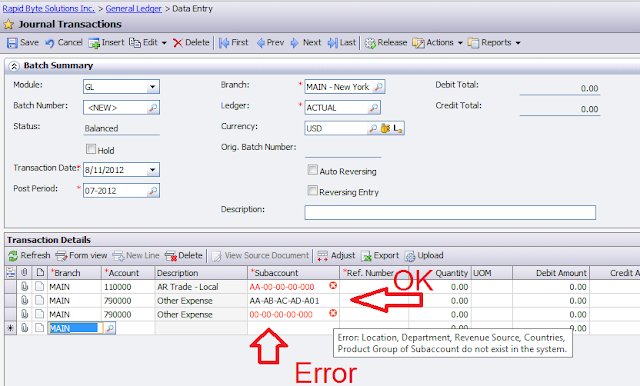 How to choose specific valid account / subaccount (cost center) combination? For example, all balance sheet accounts need to get tied to a single sub account, while Profit and Loss ones have to go to multiple, depending on the account nature and sub location. In most of the systems we should specifically indicate valid combinations, then make a template, to be used with each new account or sub added to the system. Looks tedious. This approach seems to be not very effective, especially is you have hundreds of cost centers. 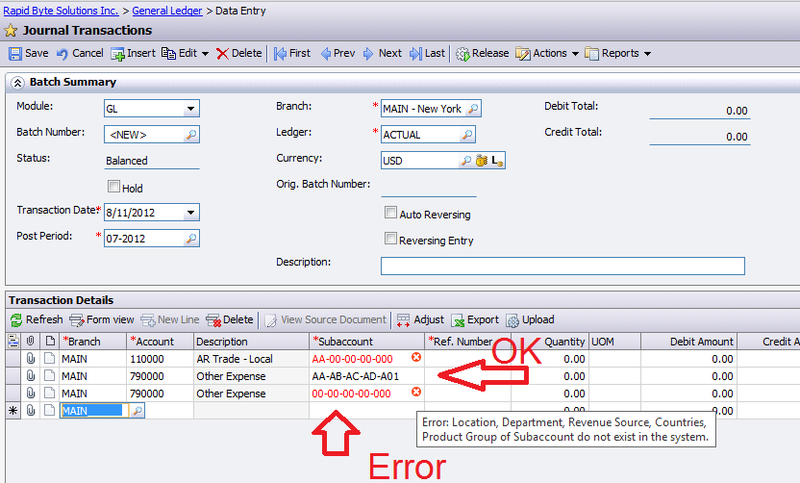 In Acumatica we have restriction groups, that can help to define validation rules. I will be using Acumatica demo system to show how to configure it. Let say we want all B/S account to get only tied to subaccount 00-00-00-00-000, while PnL account to all other subaccounts, excluding 00-00-00-00-000. 2. Lets select all BS accounts in the Accounts Tab. And then Save the group. 3. Lets get to Subaccount Segments Tab. And select 00-00-00-00-000 only. 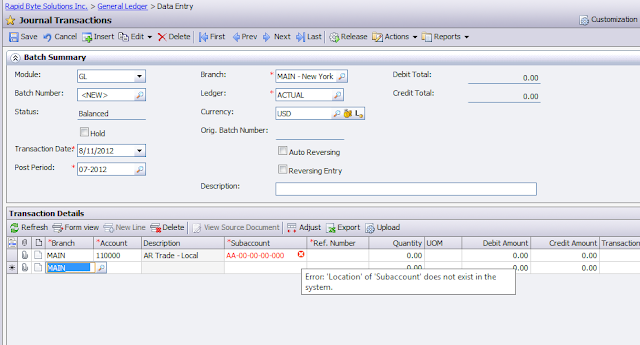 System prompts for invalid Location Cost Centre (first segment) for my Subaccount. For the second line it was OK, because it does not contain 00 segments, but attempt to manually enter 00 sub in the third line resulted in Error message for all involved Cost Centres. How to identify the sub-account? 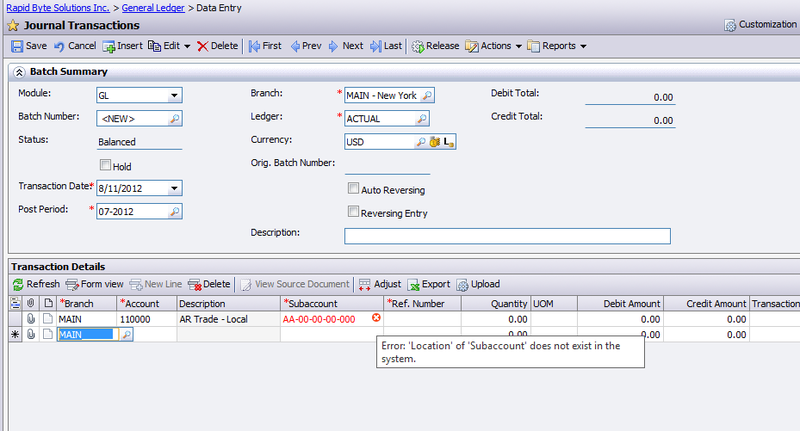 During system setup Subaccount segments are defined at the Key Fields, then Subaccount screen. Who is On-Line? Active Users.